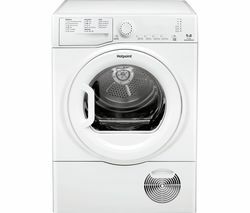 Compact and energy-conscious, Hotpoint tumble dryers are built with style in mind. Designed to match Hotpoint washing machines, these dryers make it easy to achieve a smart, streamlined look in the kitchen. 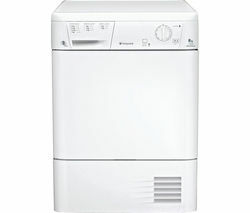 The Hotpoint tumble dryer range includes vented dryers as well as condenser tumble dryers that don’t need to be vented. This does away with pesky tumble dryer hoses and gives you the freedom to position your tumble dryer anywhere you like. With capacities ranging from 4kg to 9kg, and finishes including classic white, graphite and black, it’s easy to find a Hotpoint tumble dryer to fit your home. There’s a wide range of drying programmes to choose from, including anti-allergy, to remove 99.9% of allergens like pollen and dust mites. The Sensor Drying System uses intelligent sensors to monitor moisture and temperature levels and stops when your laundry has reached the level of dryness you've pre-selected. And with Garment Care functions and cycles designed for wool and delicates, you can trust Hotpoint tumble dryers to protect your fabrics. For single garments you need dried in a jiffy, to family-size washing loads and delicate woollens and fabrics, Hotpoint tumble dryers are here to help. Take a look at our full range of tumble dryers from great brands such as AEG, Indesit, LG and many more.